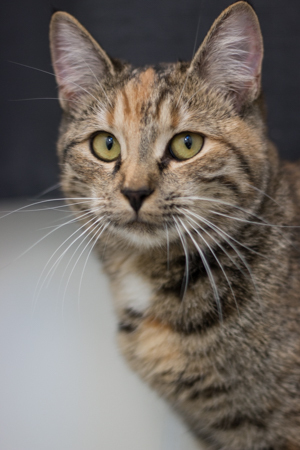 My name is Gemma and I am a gorgeous and friendly 8-month-old torbie girl with tons of purrsonality! Even though I’ve been through a lot of transition lately, nothing seems to stop me from rubbing up on people and chirping for attention! I’m still a young and playful kitty, so I’d probably do well as a companion for a family where I could receive lots of love and play time. Though I’m young and could probably learn to live with other kitties, right now it seems like I’d prefer to be the only feline friend in the home. So far I seem to charm everyone I meet — so come meet me today! I’m living at PetCo Unleashed on NW 23rd & Burnside and come to you spayed, vaccinated, and micro-chipped for an adoption fee of $100.